So, with the depressing news that our magnolia died, I decided that we needed to replace it ASAP. I couldn't let this failure keep us down! Instead of ordering online however, and allowing our tree to die (again) waiting in the office for me to pick it up, I insisted on buying local. 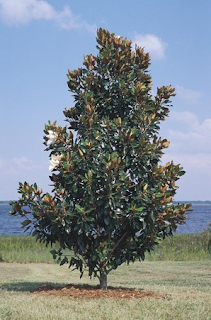 I could have gone down to the local tree nursery, and lovingly hand selected a new magnolia, but to be absolutely, brutally honest, I think there is a high possibility that I could kill this one too. We went committed, but not too committed. With that, we picked up this beauty at Lowes. We also picked up a pot from Target, that works just perfectly for it. It's a Magnolia Grandiflora, which is the species of the typical Southern Magnolia. We went with a small variety, so this one will probably only get to 20 feet. Silas did note that he didn't think that our old magnolia could have supported many well wishes from our guests, but that this new one (currently around 5 feet tall) will have enough nooks, crannies, and branches for an overabundance of well wishes. I guess in the end, the tiny magnolia tree demise was a good thing (though it cannot be good karma to kill trees! ), and we ended up with the magnolia that we needed all along. Fingers crossed that I can keep this one alive. Did you have any situations that actually turned out to be blessings in disguise?